A perfect ride – what did it take? Fun, for a start. And sun, not to forget. Me and my bike and some stunning scenery – that was a perfect ride for me. No breakdowns, no annoying cars, not a soul in sight. Just summer and the coconut smell of Scottish gorse, a sea breeze and a powerful engine roaring through the wilderness. And the riding was easy indeed. Added to that a little treat – a fruit scone, home-made jam and cream when the road took me back into civilisation. Perfect. And I had just the idea, where to find all that. There was a slight breeze from the sea as I was getting ready for the trip. When I am alone I sometimes talk to my bike and I did that, telling her where we would head out for today. A seagull was crying out in protest when I started the engine. Once I was past the dodgy gravel of the driveway the sky was the limit. After about an hour I had my fist stop. I needed a coffee to warm me up. Even though the sun was out it was still fairly cold. I had parked the bike at the wee harbour, watching the boats on the water I got dressed to take on the next part of the journey. Funny how Ewan has always seen me as a biker, he had never questioned the woman part of it. I had a bike and I hung out with the Blue Angels, so I was a biker for him. As if in his world there was no sexism or prejudice. I liked that. I certainly wanted his respect and I did not want to overstay my welcome, I had to face going back to Glasgow soon. I wanted Rob to be proud of me and I wanted to do things right. With one last look over Plockton harbour I started the engine, it was time to say good bye soon. 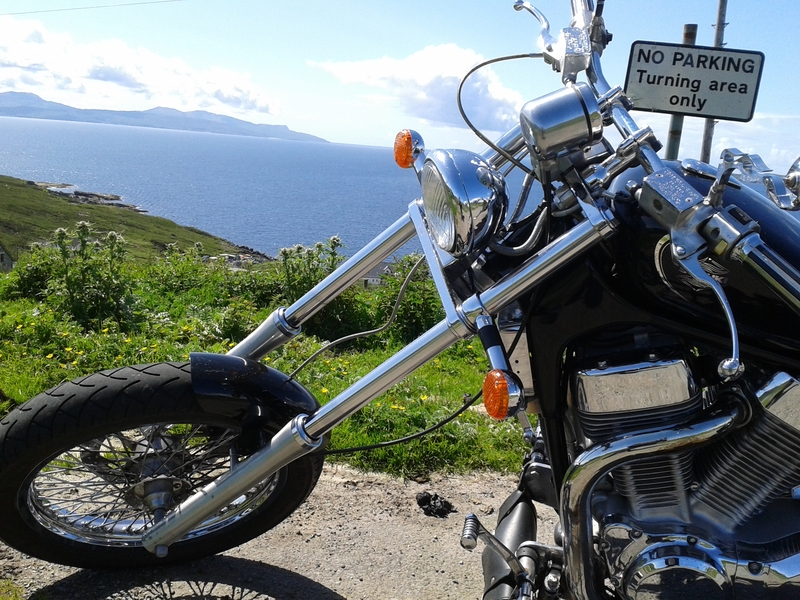 But until then I had a wonderful day ahead of me, it was not even lunchtime, the sun was out, and I was heading for Applecross and the most challenging road Scotland has to offer for bikers. A steep single tracker that takes you all the way up to the cattle pass, the Bealach na Bà, winding up in tight hairpin bends where a long fork would find its limits. Since my HD was so new she was still pretty original and therefore an ideal bike to take on the challenge, reliable and nimble. But my, that was a challenge nevertheless. Approaching the climb coming from Lochcarron you saw a huge sign warning caravans and unsuitable vehicles before you passed the bright orange snow gates. They were open. At first the road took you leisurely up the hill, then it tightened slowly into a single-track road which means no two vehicles can pass each other, nor can a bike and a car, it was that tight. Passing places were used for that and often one of the cars meeting had to reverse. If you did not like reversing with a steep, unfenced drop right next to the roadside, well then you are having a problem. Being a biker, I was safe there, no reversing for me. I was lucky, there were hardly any cars coming towards me on my way up and I could drink in this fantastic view of the Torridon Mountains ahead and the sea and the steep climb behind me. These were the most awe inspiring and challenging ten miles of road in Scotland. There was no way I was going to miss them. Rock broke the surface of the ground in many places, there were not trees and little growth. A rocky green and brown barrenness all the way up to 626 meters. It didn’t seem a lot but since it rose from sea level it felt more massive. In places like this you could feel alone and very small. The crofters of old would take their cattle along this pass, hence the name. No fun especially in winter or bad weather. And you certainly did not want to be caught out by fog or strong winds on a bike. I had been fine going up but encountered a few rather tricky situations on the way down. Cars that would not reverse to the next passing place (No, I can NOT reverse up the hill!) or moments where I had to hit the brakes on this road full of gravel and the back wheel started overtaking. But I managed all these tricky moments nicely and once I had made my way down the pass into Applecross I could rest outside the Inn in the sun with a beer watching the sparkling sea. Yep. I made it. Life couldn’t get better than this. 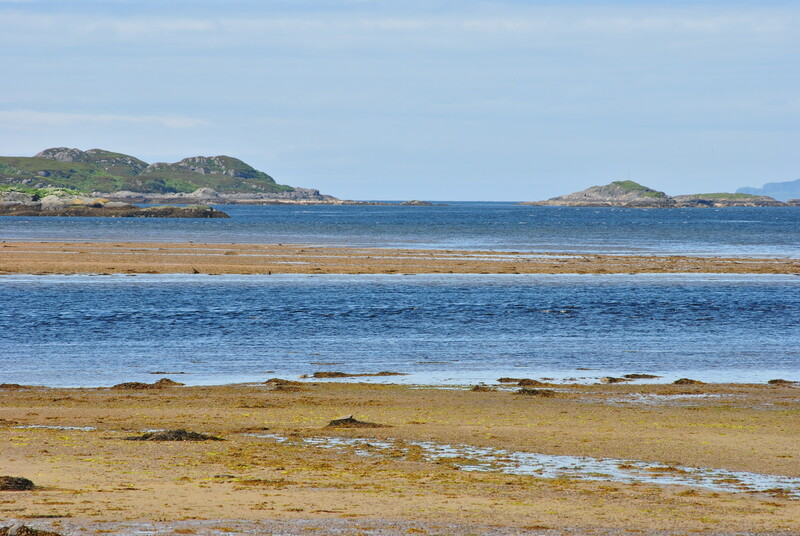 Riding back, I took the route along the coast from Applecross towards Shieldaig, a more serene beauty this time. The sun was shining, and the Scots Pine trees gave the scenery a touch of Mediterranean sweetness. The gorse framed roads were winding and climbing and falling but once you got the rhythm it was a fantastic ride. I felt one with my bike, the road and my life. This was where this whole trip had taken me. This was, what I had hoped for. I was here, right at this moment in time and I was happy. I changed gear and with a roar accelerated towards the horizon. This is a chapter out of my new book Riding Towards Shadows, available on Amazon. Riding Towards Shadows is my very own road movie turned book, a true journey to my heart, my way of dealing with the demons of my past; love, death, and redemption. Arriving in my forties, I started asking myself who I really was, what my life was about and where I wanted to go from here. I had a successful career as a journalist, but something was missing and there was still a twenty-year-old unsolved issue. The man I loved had died in a motorcycle accident in the early 1990s in Glasgow, Scotland. I never told him I loved him. He never knew, or did he? The pain had never left me. It was time to give him the send-off he never had. And it was time to face the shadows from my past. That was the beginning of this journey. All lovers of road movies know one thing; the means of transport plays a major role in this. I have been a biker all my life, now was the time to go for the real thing. I bought a Harley-Davidson and rode north, a thousand miles towards my past; not knowing, what or who I would find. Could it be peace and awareness? I hope my search for inner and outer freedom, my way of dealing with my sorrow, and my determination to do things my way, especially as a woman facing so much sexism and stereotypes, will appeal to some and maybe inspire others. Never cease to dream. Of course, this is also a story for all those lovers of road movies, motorcycles and the easy rider myth. This is my journey; it taught me a lot. Let it inspire you, everything is true as I remember it. What is the perfect ride? May be many things: a busy rally, a desert trip, a cruise along Sunset Boulevard – there are so many bikers out there, so many different ideas what a perfect ride should be like. Even my own idea of a pefect run differs occasionally. But very often, this one song goes through my head as my bike takes me to the horizon: Summertime and the living is easy…. A perfect ride – what does it take? Fun, for a start. And sun, not to forget. Me and my bike and some breathtaking scenery – that is a perfect ride for me. No breakdowns, no annoying cars, not a soul in sight. 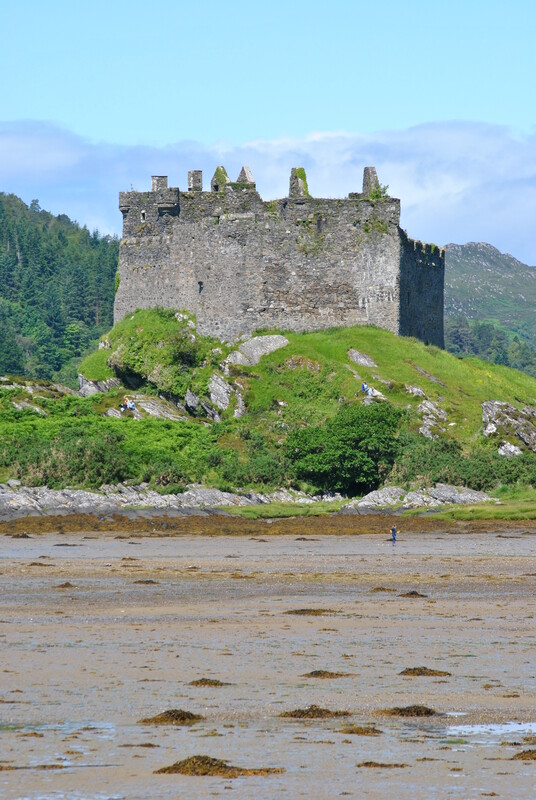 Just summer and the coconut smell of Scottish gorse, a sea breeze and a powerful engine roaring through the wilderness. ….and the riding is easy indeed. With a little treat – a fruit scone, home-made jam and cream when the road takes you back into civilisation. 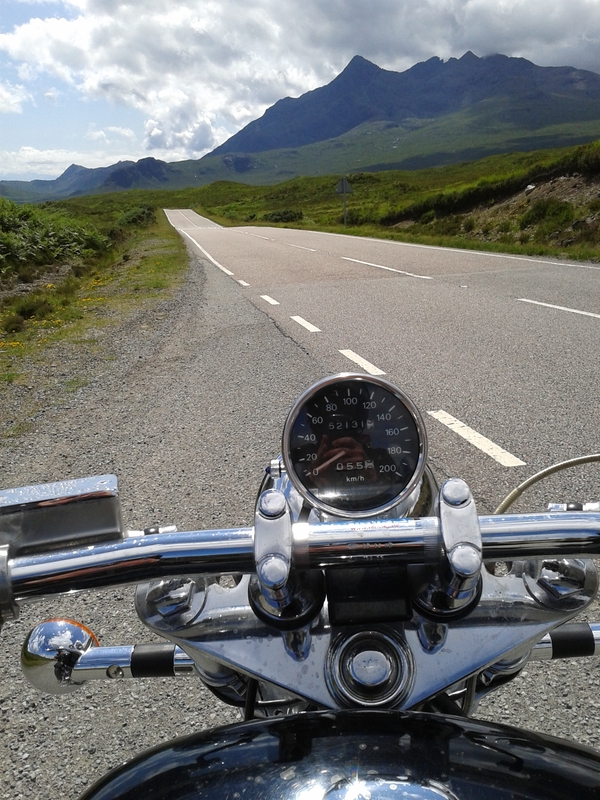 The Scottish Highlands can be ferocious, relentless and dangerous even on a bike. Storms are battering the West coast of this Northern beauty, heavy rainfall and flooding block roads, low temperatures make you freeze even in summer. Scotland’s for the brave indeed. But on a day like this it is just breathtakingly beautiful. Is there a better country to ride a bike in? Scotland asks you to be brave, you need to be prepared to fight: the roads, the climate, the tourists. Bikers are getting killed every week here in summer and still they come here like hordes seeking the enemy, from England, Germany, France, Holland and Norway, drawn by a magnet of incredible magnitude: the beauty of the wilderness and the strength you draw out of coping with its adversities. Scotland is a county for heroes, always has been and still is, on the bike. In a way it is like one of these adventure holidays people book to get the thrill of their live. On a bike you don’t need to book anything, adventure follows you wherever you go. When I come back home from a drive through this magnificent part of the world I do feel different, stronger, braver, more self-assured. And any time I am more in love with this country.